We all have those people in our lives that are tricky to buy for, but it’s impossible to go wrong with these gourmet gift baskets. With a quick glance at this list, you’ll see that there are a massive variety, and they suit different tastes and needs, from wine baskets to gluten-free. If you enjoy Italian flavors then this ‘Tour of Italy’ set is perfect. It comes beautifully arranged and jam packed full of the most delicious foods and snacks, from crunchy Italian cookies, handmade artisan pasta, lemon wafer bites and so much more, you won’t know where to start. Whether they’re a fan of either sweet or savoury tastes, the ‘Ladies Tee Time’ basket is just right for them as it has a good mixture of both. Let’s not forget about that amazing packaging though – if you have a lady in your life who enjoys ‘putting’ her skills to the test, she’ll love this. Whether you’re out to (seriously) impress your guests, hosting a tea party, or you just need a quick yet utterly delicious gift idea for that special someone, take a look at this beautiful basket crammed full with the most rich and decadent baked goods, from peanut butter and fudge brownies to lemon cookies. No matter the age of the upcoming birthday boy or girl, be it 5 or 50, this sensational birthday care package from Gourmet Gift Baskets really will be the ‘sweetest’ of gifts and bring unbeatable amounts of joy. It comes with colorful balloons, bundles of yummy candy, and tantalizing treats. This gift is certainly impressive. With so many gourmet goodies, where do you start we hear you ask? Well pour yourself a warming mug of ‘perfect potful’ coffee and we’re sure the tastes for whatever you may fancy will come ‘pouring’ in – will it be the chocolate wafer bites or a chunk of dark chocolate? One of the many reasons why gift baskets are so great is because if you buy them online they can be sent straight to the recipient, and while you may not be there to cook them a delicious hearty breakfast, you can give them quality ingredients to make their own with this unique gift idea. Just look at that absolutely stunning faux-leather display suitcase, isn’t it just beautiful? It oozes class and decadence like no other gift possibly could, it really is a sight to behold especially with those bottles of luxurious red wines and wonderful snacks, from chocolate covered nuts to handmade French truffles. All adults know just how tiring, stressful and tedious it can be when exam time comes around, and although you can’t take the stress and worries away, you can cheer them up and help them feel so much better with this exam care package. It’s packed with pretzels, popcorn, cup noodles and other yummy treats. Why not be different and, rather than buying a simple bouquet of flowers and the usual chocolates (although they are lovely they can also be a little boring), push the boat out with your gift giving this year by sending your loved one this beautiful basket, ‘jam’ packed full of juicy fruits. Show that special man in your life just how much you love and adore him with this bucketful (literally) of bottled beers from around the world, along with fiery buffalo flavored popcorn, crunchy peanuts, meaty peppered beef jerky, and tasty summer sausage that pairs just beautifully with those flavorful beers. While unfortunately you may not be able to travel to a real restaurant in Tuscany, you can still enjoy all of those amazing, authentic flavors with this ‘Table in Tuscany’ gourmet gift basket. 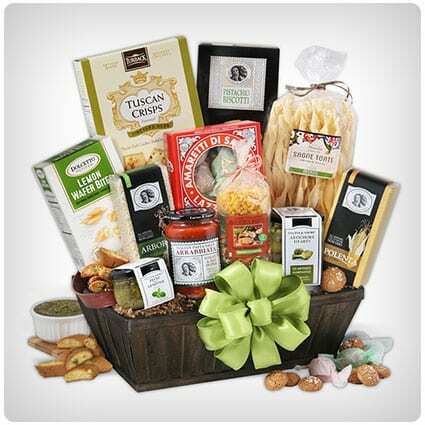 The beautiful basket contains a jar of puttanesca pasta sauce, tiramisu wafer rolls, sundried tomato bruschetta, and much more. Give the BBQ chef in your household the best gift ever with the Barbeque Boss set. Bring any barbeque to the next level with all of these amazing rubs and sauces: burger seasoning mix, Touch o’ Heat BBQ sauce, fajita seasoning mix and lots more – is your mouth watering yet? If you have family across the States, this’ll be the easiest way of sending an impressive gift that they’re all bound to love – who doesn’t enjoy receiving tasty snacks? With over 20 pounds (yes, you read that right) of yummy snacks, placed inside of a 3 foot long basket, it’s sure to please everyone. If you’re struggling to find an amazing gift for your gluten free friend or family member, then stop here because this basket is the ultimate snackers dream. They don’t need to pick through and see what they can and cannot have, with this basket they can rest assured they can eat EVERYTHING inside – wahoo! Spoil the special people in your life with this absolutely luxurious wine basket. It’s crammed full with 3 bottles of wine – a smooth Chardonnay, Mencia Roble and a beautiful Sangiovese. Of course, they come with complementary gourmet snacks like hearty cheddar cheese and crunchy crackers – it’s utterly delightful. If there’s someone who’s been feeling a little down lately, or they’re a bit stressed, you’re guaranteed to cheer them up hugely with this amazing junk food care package. This package really is one big heartfelt cuddle in a box, from chocolate chip cookies to easy heat-and-eat dinners, it has everything they’ll need. Nothing says this is an Italian gift like presenting it all inside of a huge red keepsake colander – to drain that delicious Fiesta Fioretti Pasta in, of course. The classic red colander will fit into any style kitchen, no matter how modern. If you’re wondering which scrummy treats are inside, go take a look. With its free shipping, you really couldn’t go wrong by sending the ‘coffee break’ basket to your loved ones. Everyone enjoys sitting down and relaxing with a luxurious hot coffee, and who could resist snacking on a few of those gorgeous goodies? Especially those decadent caramel chocolate chunk cookies. With freshly harvested juicy, delectable fruits like pears, apples and zesty oranges, this ‘bountiful harvest’ gift set is truly irresistible, but that’s not all you get with this arrangement; it also comes with gooey chocolate covered caramels, sea salt caramel sauce, and other simply divine foods to snack on. Why not treat yourself with this dreamy set. The basket comes chockablock full of everybody’s favorite yummy treats, such as gorgeous chocolate sea salt caramels, handcrafted salt & pepper popcorn, fruity cherry buds and a whole lot more, presented inside of a pretty blue basket and finished off nicely with a golden bow. Treat the gardening enthusiasts to this divine gourmet gift basket and watch their faces light up when presenting it to them. It’s an incredibly thoughtful, ultra tasty (of course) gift that they’ll be sure to cherish. The basket even comes with 2 essential gardening tools, with lovely snacks to enjoy after all their hard work. There’s no need to feel guilty eating those scrumptious baked goodies if they’re balanced out with fruit…right? Right. The crisp fresh fruits (red & green apples, pears and oranges) are displayed amongst the most delectable flavors of brownies and cookies inside of a pretty wooden wicker basket. Finding a tasty Kosher gift can be a bit tricky , but don’t worry – this amazing basket is here to save you from the troubles of searching high and low. Inside are a whole array of kosher foods like a salty peanut brittle, sour apple hard candies, dark chocolate pretzels, and so much more. No matter the upcoming occasion, this snack & chocolate basket is utterly perfect and seriously generous. The beautiful basket is crammed full with the finest of snacks, like crackers and sharp cheddar cheese, sweet corn tortilla chips, summer sausage, and (like we could ever forget), the chocolate chunk cookies! Could you imagine how overjoyed and grateful your chocolate loving friend will be if you bought them this seriously impressive chocolate and snack arrangement? We’re sure they’d appreciate it massively. With almost 20 treats, it’ll last a long time and whenever they go to pick one up they’ll think of you. Show off your sophisticated side with this ultra impressive red wine and chocolate set. You’ll find them encased inside of a simply gorgeous black faux leather basket that’s decorated with a huge fancy red bow, that once all the goodies are finished, they can then use to store their own collection of wines. You can alter this gift basket to suit your budget or the recipient’s tastes, so whether they’re a fan of classic Prosecco, Veuve or a luxurious Dom Perignon you can choose which they’d prefer. There’s more to this basket than Champagne though, as it also comes with gorgeous truffles and other tasty delights. Help them get better and ensure they get those vital vitamins for a quick road to recovery with the ‘Get Well Soon’ basket. It’s said that taste buds become dull when sick, but we’re sure they will definitely enjoy the crisp, fresh fruits that come in this heartwarming basket – it’s bound to brighten anyone’s day. We couldn’t think of a person who wouldn’t possibly enjoy this stunning array of divine, melt in the mouth chocolates and other sweet goodies. The basket truly looks irresistible, and no matter who the recipient is whether that that be your grandma or a group of work colleagues, they’re sure to dive in straight away. Well, with this set brunch is certainly on you, and what a mighty fine brunch it’ll be. Included in this set are the freshest of fruits, New Hampshire maple syrup, country ham biscuit slices, 2 ‘perfect potfuls’ of gourmet coffee, a super lovely blueberry and pomegranate jam, and of course, no brunch is complete without oatmeal. Gourmet Gift Baskets bring you this super impressive ‘Happy Birthday’ tower. There’s surely no other gift like this one, and it’s brilliant for anybody no matter their age because who could really resist sweet popcorn, laffy taffy, pretzel twists, and everything else this simply delightful tower offers up? This gift will certainly be a ‘hole in one’ for any golfing enthusiast you may know, or why not try to butter up the future father-in-law? You’re sure to become his new best pal if you offer up these delicious goodies, especially with that seriously awesome golf bag packaging – there’s no way he could resist. No matter your recipient’s tastes and interests, by following and copying these simple yet utterly gorgeous DIY gift baskets ideas over on Popsugar.com, you’ll become a pro at throwing together decadent snacks and little thoughtful nik-naks to create the perfect gift basket for anybody, in no time. For any Italian food enthusiast, why not give this DIY pasta dinner basket a try? It’ll make a brilliant, thoughtful gift for any occasion. You don’t need to spend too much to find high quality ingredients to fill it with, and from there it’s easy to put together – take a read to find out how. Take a look at these incredibly easy, yet super thoughtful DIY wine gift basket ideas. Like the author says, everybody has a wine lover amongst their friend group or family, so it’s a good idea to learn how to throw these types of things together because you may never know when you need a quick gift.